We are acutely aware that meeting the housing needs of current and future populations is a critical issue facing communities nationally, regionally and locally. Locally we recognise the role Wirral Waters can play in the delivery of any local housing strategy and the importance of brownfield developments in reducing the pressure to build new homes on Wirral’s green spaces. We and our partners remain absolutely committed to house building on the Wirral Waters site. With both Enterprise Zone status and Housing Zone status Wirral Waters is unique in the UK. No other project has both designations. This is a recognition by Government of the assistance and support the area needs. These tools are needed to address the very real issue of market failure. A mixture of high density, sustainable residential homes for a wide variety of incomes, people and family types will of course help to relieve pressure on Wirral’s green belt. At Peel we have a long, successful and ongoing track record of delivering transformational regeneration projects working in partnership with Local Authorities across the UK. These include major regeneration projects such as Glasgow Harbour, Chatham Waters, Gloucester Quays and of course Salford Quays. From this experience we know that the ultimate target of 13,000 units can only be delivered with true and honest collaboration and genuine partnership working with the public sector. This involves a ‘whole place’ approach to regeneration including the planning and delivery of the wider underpinning infrastructure. During the past five years, Peel has been undertaking a huge amount of activity behind the scenes at Wirral Waters. We have carried out millions of pounds worth of remediation work covering around 60 acres of brownfield land, demolishing over 20 acres of derelict buildings, installing new energy infrastructure and drainage and starting the process of improving the environment with over 1,500 newly-planted trees. March 2018 saw the announcement of three major housing projects set to bring over 1,000 new homes to Wirral Waters. These three projects represent around £160 million of investment and is probably the largest investment in housing on the Wirral since Port Sunlight. However, they represent only the start. They include the first ever joint venture between Peel and Urban Splash, two of the North West’s leading developers. 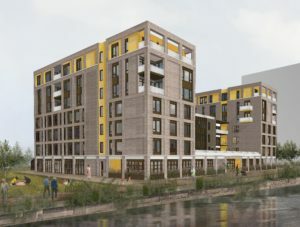 The £60m development will comprise of 347 modular homes in the Northbank neighbourhood of Wirral Waters. In addition, Peel announced a partnership with award-winning care provider, Belong Villages. This collaboration will bring a state of the art dementia care village to Wirral Waters, comprising 34 one and two-bedroom apartments, which will be available to rent or buy; plus, six dementia households where 24-hour support is provided for up to 12 residents in each. This is equivalent to 109 new homes. The project will include a range of amenities, including bistro, gym and hair salon and will employ around 150 people. The formal planning application was submitted to Wirral Council in April. Finally, Wirral Waters One (the Legacy Foundation project), a £90m scheme for 500 apartments, was approved by the Cabinet of Wirral Council in February. We are currently in the final steps with Wirral Council in ensuring this catalytic project moves forward. This project also includes a £100,000 investment for community activities by The Legacy Foundation. We must now get this vital project committed as it will create much needed market confidence and pave the way for a flow of other housing projects in the coming few years. Peel submitted a detailed planning application for the project in May. These first three projects are essential in creating much needed market confidence in an area that has seen decades of underinvestment. – Investment in transport infrastructure; the more investment in appropriate and scalable public transport, cycling provision and safer pedestrian connectivity, the less space needs to be given over to car parking. Thus, with higher density; more homes can be created reducing the impact on the greenbelt. – Environmental improvements and place making; investment in the surrounding environment, including green spaces, street trees, public realm and better landscaping, will create a more compelling and desirable place to live and invest. 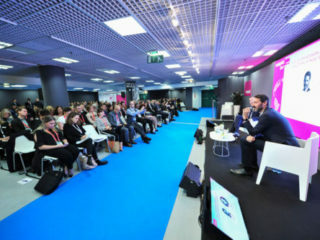 – Energy and technology infrastructure; creating future places is increasingly dependent on the availability of sufficient sustainable energy and high-speed connectivity. As with most developments on brownfield sites, there is a direct link between the pace and scale of housing delivery and a coordinated, ‘whole place’ approach to the planning and delivery of the infrastructure that underpins growth. We have therefore outlined to the public sector three potential scenarios of house building at Wirral Waters to 2035 i.e. in line with Wirral’s proposed Local Plan period. Our forecasts range from 2,900 to 6,450 new homes. This is NOT the duration of Wirral Waters which covers a longer period. Home building at Wirral Waters will of course continue to accelerate beyond the Local Plan period, with the ultimate target of over 13,000 homes achievable at Wirral Waters. Wirral Waters is the biggest regeneration project in the UK. It is a mixed use, high density, and highly sustainable development. It is ‘place led’ but ‘jobs driven’. Delivery has started and over the next three years, more than £200m is expected to be invested across a range of mixed use projects clustered at Northbank, Four Bridges and MEA Park. This pipeline of activity follows the years of intense activity behind the scenes as listed above. These projects will create jobs, training and skills opportunities as well as the housing detailed over the coming years. September 2015 saw the completion of the award-winning Wirral Met College Construction faculty, which was developed by Peel and was the first new building in Wirral Waters. The college campus is circa 38,000 sq ft with construction courses aligned to Wirral Waters and focused on the Built Environment. The design of the building secured a RIBA Regional Award, a RIBA National Award, a Civic Trust National Award and a Wirral Society Award for Excellence. In November 2015, Tower Wharf, a 48,000 sq ft office project developed for the Contact Company was completed. 2018 / 2019 is set to be a busy year with a raft of projects moving forward and reaching significant milestones. 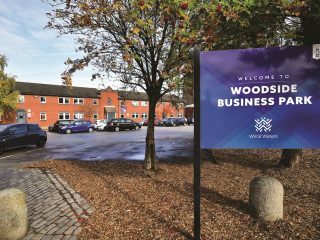 While detailed planning consent and funding arrangements for some individual schemes still need finalising, Peel are confident about collaborative delivery of this next phase of the development. Among the next improvements Wirral residents will see is an improved environment on Tower Road and Dock Road through new public realm work. Funding totalling over £3m is now supporting improvement works along Tower Road aimed at improving the environment, prioritising cycling and pedestrian provision and better transport infrastructure. Some associated works have already taken place in front of the new College and along Dock Road. This will change the complexion of the area where activity is taking place within Wirral Waters, making it more user-friendly for cyclists and pedestrians, raising the quality bar and providing similar environmental benefits to other major European cities thus helping to ensure that Wirral Waters becomes a sustainable place to live and work. In March 2018 Peel formally submitted a planning application to Wirral Council for a new office scheme, No1 Tower Rd South, which will provide 30,000 sq ft of Grade ’A’ quality office space aimed at the small and medium sized businesses. The ground floor will include an incubator facility and co-working space for Birkenhead’s entrepreneurial sector, while the two upper floors will feature high quality office accommodation in six suites overlooking Liverpool’s waterfront. 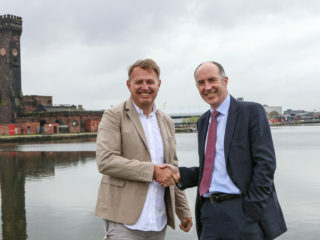 A £20m Maritime Knowledge Hub is set to open in 2020 in a collaboration between Mersey Maritime, Liverpool John Moores University, Wirral Council and Peel Land and Property. The Hub will ultimately include office space for maritime organisations, serviced business start-up space and support, an offshore survival centre and marine simulation centre, and teaching space. In May 2018 award-winning firms, Schmidt Hammer Lassen Architects in Denmark, and Ellis Williams Architects in Liverpool, were chosen to design the Maritime Knowledge Hub. 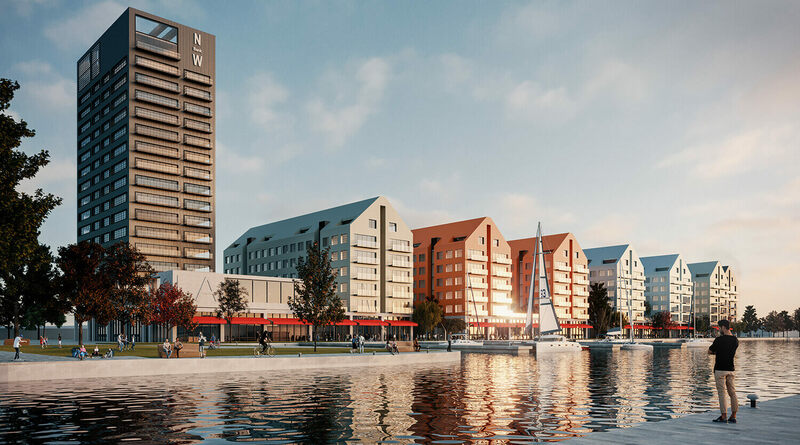 will comprise a dockside restaurant and bistro, small independent retail units, artists’ studios, a gallery, managed workspace and even a large public events space.